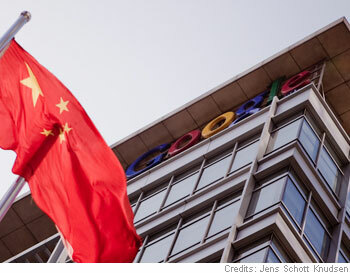 The WSJ reports that China blocked virtually all searches by Chinese users on Google (GOOG) sites Tuesday, sharply escalating the battle with the California-based web giant – a week after it stopped censoring and filtering Internet searches in violation of Chinese regulations. The move means that Google has now lost access to one of the biggest markets on the planet [ I wholeheartedly applaud Google’s brass for taking a stand] that could have been a major source of its long-term growth. WSJ: Users in cities across China starting late Tuesday afternoon reported that all searches—even of terms as mundane as “happy”—on Google’s Hong Kong site produced an error message saying the results page couldn’t be opened. Google stopped operating its self-censored Chinese search site on March 22 and began routing Chinese users to the Hong Kong site, which Google doesn’t censor. Searches by Chinese users on Google’s main global site, Google.com, also returned error messages Tuesday. Users in some cities said they couldn’t access Google.cn, the mainland Chinese Web address Google has long used, which since last week has automatically sent users to the Hong Kong site. Google’s music search service also appeared to be inaccessible. It wasn’t immediately clear if the disruption would be permanent. China’s Internet censorship regime, unofficially known as the Great Firewall, is opaque and unpredictable and officials almost never discuss its workings. Wang Lijian, spokesman for the Ministry of Industry and Information Technology, one of China’s main Internet regulators, said he was unaware of any disruption. A Google spokeswoman declined to immediately comment. In an unprecedented stand against cyber attacks and censorship, Google, which entered the Chinese market five years ago, announced in January that it would stop obeying Beijing’s intrusions and censorship rules, threatening to pull out of China altogether after uncovering several sophisticated cyber attacks against its systems and email accounts used by Chinese activists. I don’t know if its ethical or not blocking any country and for a country to block a global search engine..